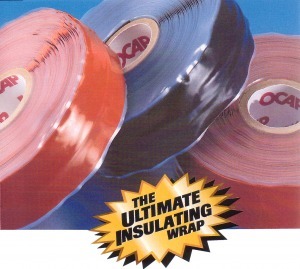 X-Treme Tape is the Original self-fusing silicone insulating & repair wrap. Originally developed for the military, this new silicone based repair tape will be an essential for your tool box! It's self-fusing, and requires no adhesive since it only bonds to itself. X-Treme Tape® stretches to 3 times its length, conforms to irregular shapes easily, and withstands UV rays, acids and fuels. Won't melt to 500° F, so it can be used for emergency muffler repairs. Remains flexible to -60°F. Insulates to 8000 volts – ideal for short term electrical repairs. Forms a permanent air and watertight seal – fix that leaky pipe, radiator hose or air duct. Once wrapped over itself, it forms a bond immediately, and is permanently fused in 24 hours.